On Saturday, October 12, Arkansas Native Plant Society (ANPS) members visited two sites in the Ozark National Forest just north of Mountain View. 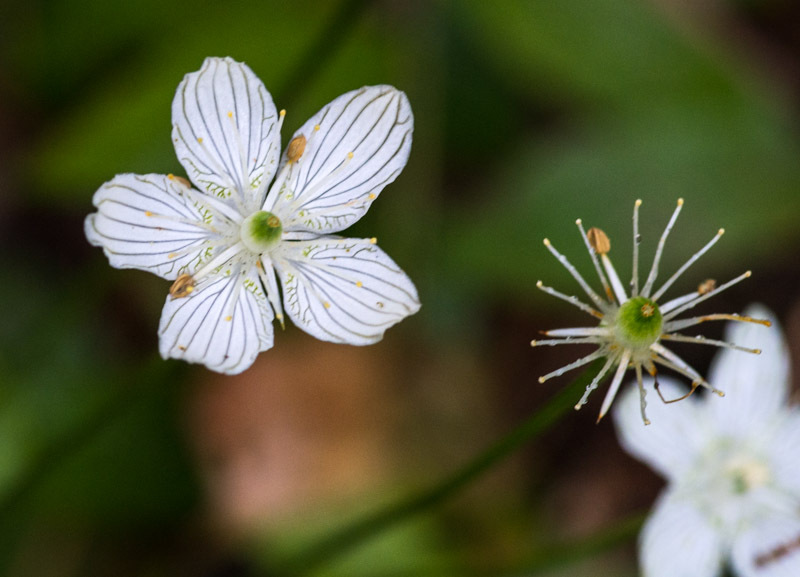 Large-leaf grass-of-Parnassus (Parnassia grandifolia) is not a grass at all, but a beautiful flowering plant (and also the title of a book of poetry by Andrew Lang). The flowers have five white petals with striking green venation. The sites were only a few miles apart, one next to Livingston Creek and the other at Hog Hollow. The woods, consisting of mature mixed hardwoods and pines, were fresh after an early morning thunder shower. Chasing after native plants can be hard on your running gear! 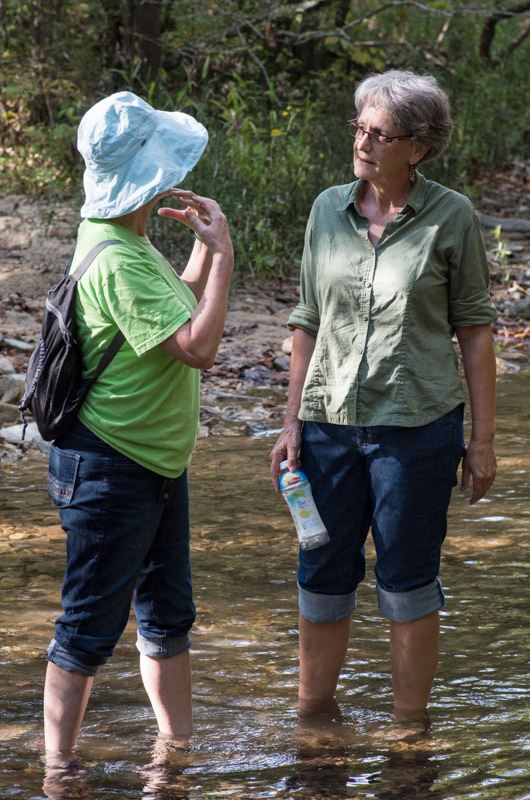 ANPS President Betty Owen and member Susan Toone cool their feet in the refreshing waters of Bear Branch. Group leaders Linda Boulton, Dwan Garrison and Ellen Chagnon, supported by an abundance of top-notch botanists, ensured that no plant of interest was overlooked (see below for a detailed plant list). 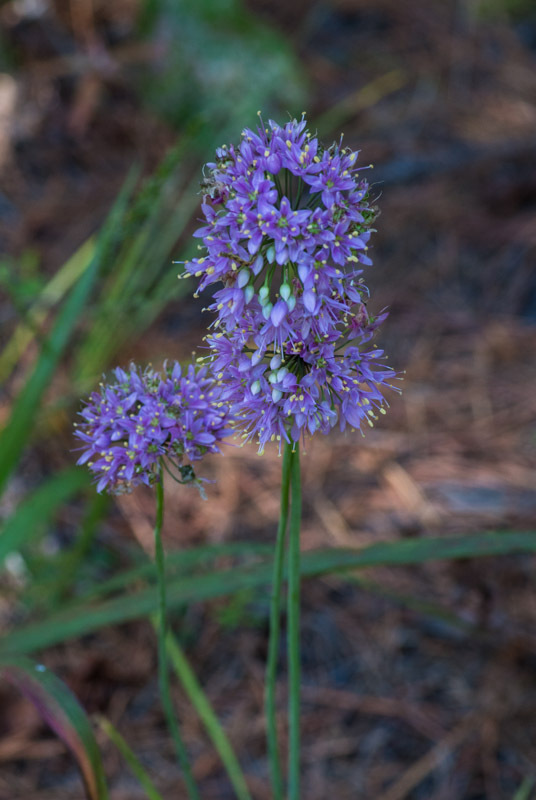 A fall glade onion (Allium stellatum) in beautiful full bloom. The first hike followed an old logging trail next to Livingston Creek. Plants in flower included beautiful grass-of-Parnassus along the edges of the creek, wreath goldenrod, rosinweed, white snakeroot, hawkweed, sweet everlasting, and Appalachian blazing star. The fruit of American beautyberry and strawberry bush along the trail were at their gorgeous peak. 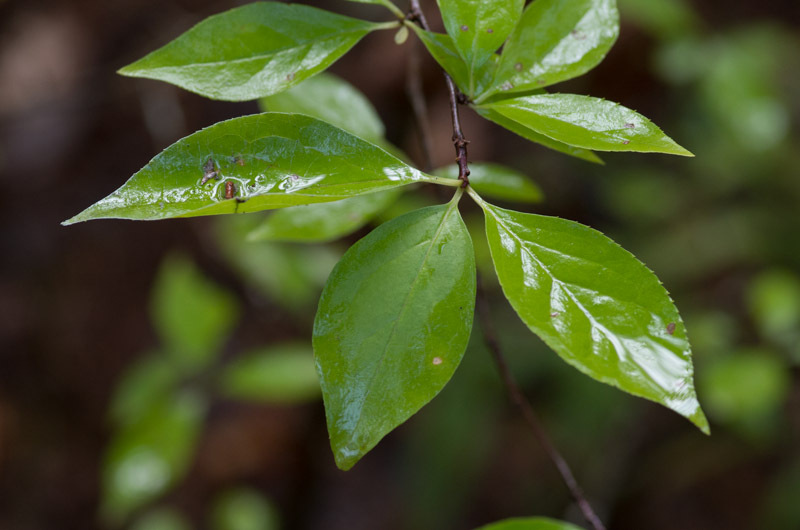 Also of special interest were Carolina holly, a deciduous holly that is similar to but much less common than possumhaw, and a fine specimen of Dutchman’s pipe vine. 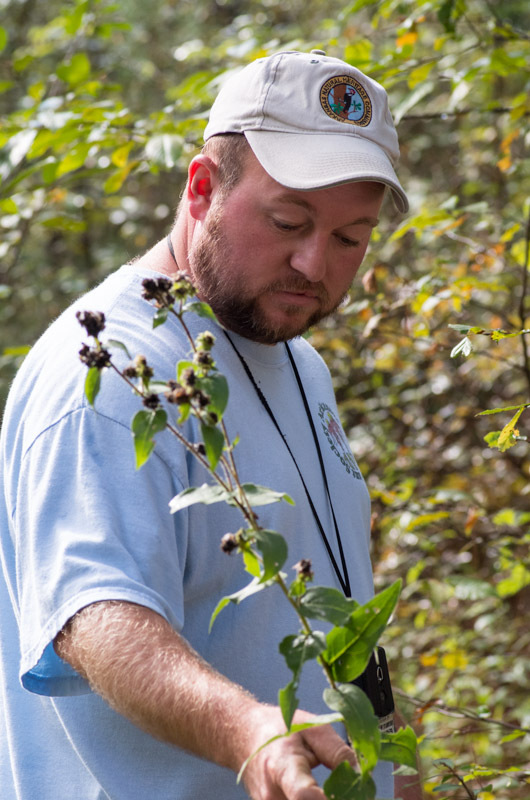 Botanist extraordinaire Brent Baker (Arkansas Natural Heritage Commission) carefully examines a starry rosinweed (Silphium asteriscus). The second hike was just a few miles up the road in Hog Hollow. The group had barely gotten out of the parking lot when the “find” of the day was spotted – an impressively large group of Indian pipes, a fascinating and unique plant that lacks chlorophyll (link to ANPS article called Know Your Natives – Indian Pipe). Sid Vogelpohl informed the group that Indian pipe has a delicate sweet fragrance. Each person took a turn sniffing the Indian pipe plants. Although some group members appeared a little wobbly afterward, there is no direct evidence that anyone got high from this experience. Several new plants were observed along the wood road leading to Bear Branch, including a fall glade onion in beautiful full bloom, wild yam vine with mature seed pods and lead plant, as well as blue lobelia and sneezeweed in bloom. The ANPS thanks Dwan Garrison and Ellen Chagnon, Arkansas Master Naturalists who live in the Mountain View area, for doing an excellent job of scouting the area and selecting sites with many interesting native plants. Thanks also to naturalist Linda Boulton for leading Saturday’s trips as well as the Gunner Pool walk on Sunday. Article and pictures by ANPS vice president Michael Weatherford. 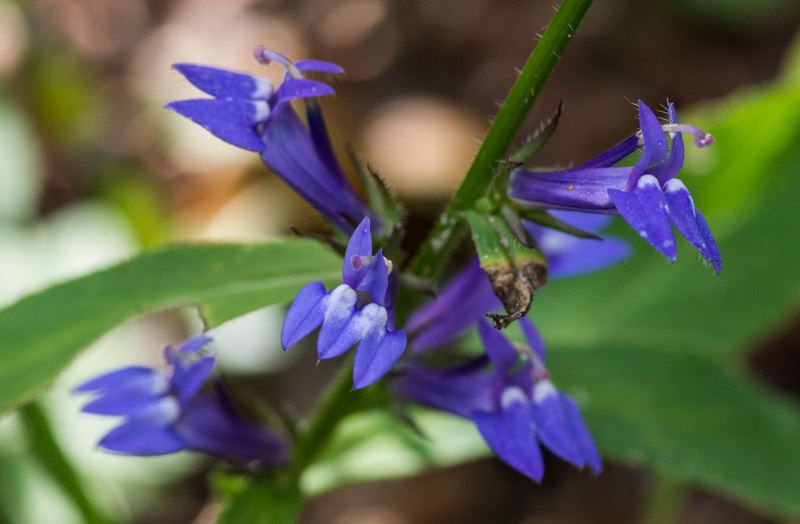 Great blue lobelias (Lobelia siphilitica) brightened the banks along Bear Branch. Anglepod milkvine (Matelea gonocarpos) might look like Dutchman’s pipe vine at first glance, but its large angular seed pod is quite distinctive. Carolina holly (Ilex ambigua) is deciduous like its close relative possumhaw (Ilex decidua) but not as widely distributed. It is distinguished from possumhaw primarily by its leaves which tend to be widest near the middle with broadly wedge-shaped bases. 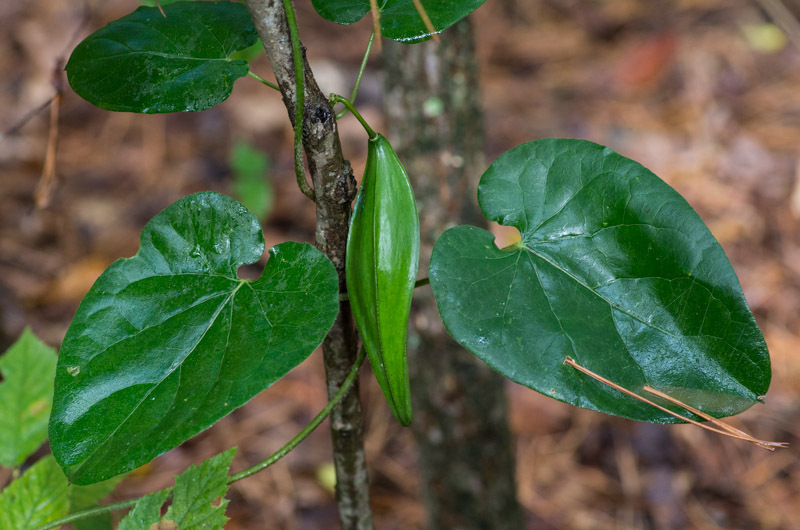 Possumhaw leaves tend to be widest above the middle with narrowly wedge-shaped bases. This entry was posted in Field Trips and tagged Arkansas Master Naturalists, Arkansas Natural Heritage Commission, Brent Baker, Hog Hollow, Livingston Creek, Ozark National Forest. Bookmark the permalink.